Late last year Bruce Burton’s big fat chickens were described as the best chook in the country. Chefs across Victoria were espousing the virtues of his slow raised, big birds with firm flesh and hard bones. The former pilot turned farmer was raising Sommerlad breed chicks on this Trentham East Farm using the highest animal ethics. They are true free range where the adult animals roam free on pastures and are fed certified organic feed. Milking Yard Farm chickens were in the media and winning national awards. Then disaster struck. The supplier of the Sommerlad chicks found themselves in a complicated investment deal that saw them wound up. Bruce and his wife Roz were left with a farm, feed and hungry customers - but no chickens. “The Sommerlad was developed by (NSW breeder) Michael Sommerlad over a period of 15 years to create a chicken that will thrive outdoors in Australian pastures,” explains Bruce. “You can’t put a chicken that has been bred to thrive in big sheds of 30,000 chickens in a paddock and expect it to do well,” he explains. “They are not bred for it.” He explains that the Sommerlad is a large bodied, multipurpose bird developed from lots of different breeds such as Rhode Island Reds, Faverolles and Naked Necks. Late last year Bruce bit the bullet. He purchased a quarter of the Sommerlad breeding stock and expanded his ability to raise his own chickens from fertilised egg. (The rest of the breeding stock was purchased by interstate breeders). Today Bruce keeps his breeding flock amongst a shelter belt between the house and the paddocks looking out to the Wombat forest in one direction and Mount Macedon to the other. “All chickens originally came from Asian jungle fowls and this mimics that environment perfectly,” says Bruce. The production flock are housed in mobile A frame homes open to pasture and protected by Max and Maisy, the Maremma Sheepdogs. With the flock up to speed again, he now turns out enough birds to supply his retailers and top restaurants such as The Lake House and Brae plus meet the increasing demand from home deliveries. The birds cost around $25 a kilogram, about five times the price of cheap industrial supermarket chicken. Are they five times as good? Free to run and flap their wings, the birds develop strong muscles and connective tissue. There is also a layer of deep yellow fat that develops under the skin. All this leads to superb flavour and texture. The flavour is far more developed and stronger than a factory farm raised chook and the texture is quite firm and to the tooth. 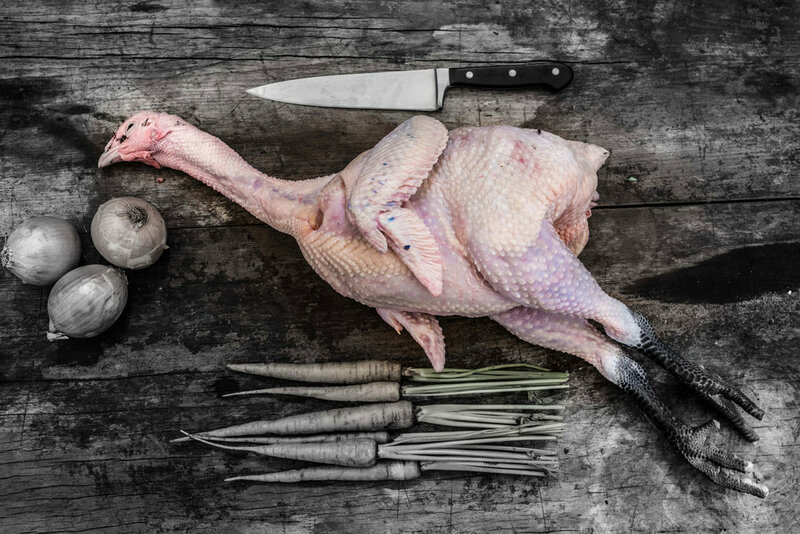 This makes Milking Yard Farm chickens perfect for slow braises and slow wet roasts – dishes that can be shared with up to 12 people. While Milking Yard Farm birds are available from Meatsmith Butcher, Hagens Organic Butchers and Peter Bouchier in Melbourne, Bruce is keen for people to make the most of his home deliveries, coming soon, to Central Victoria as well as Metro Melbourne.